Many people manage pets. Undoubtedly, it brings a lot of joy and happiness in a family. But except the enjoyable moments, pet care requires from owners certain not the most pleasant actions. Owners of cats, ferrets and other small animals regularly face the necessity of toilet cleaning for their pets. To facilitate the process, a plenty of smart people have invented an enormous number of devices, fillers, deodorants and so on. Even automatic toilets, which wash the filler and collect waste products into barrier bags, have been invented. But, first, it costs money and a lot of money, and secondly, even this does not get rid of the odor and the need to maintain the toilet periodically - change fillers, dispose of waste products and so on. I decided to change the approach to this problem radically. People do not use litter boxes for urinating. The miracle device - a toilet bowl - has been invented for people long ago. It is convenient and hygienic. Its maintenance requires minimal effort and it serves for many years. Why not make a similar device for pets? I did it! Genius lies in simplicity. Take a litter box, do a sewer drain from it and bring water from the water supply system for flushing. Since the animal cannot push the flush button itself, add automatic flush to the litter box. In fact, it turned out to be not all that simple. I spent 2 years to refine the idea to a working sample. But, as a result, an automatic toilet for small animals has appeared. And it works! 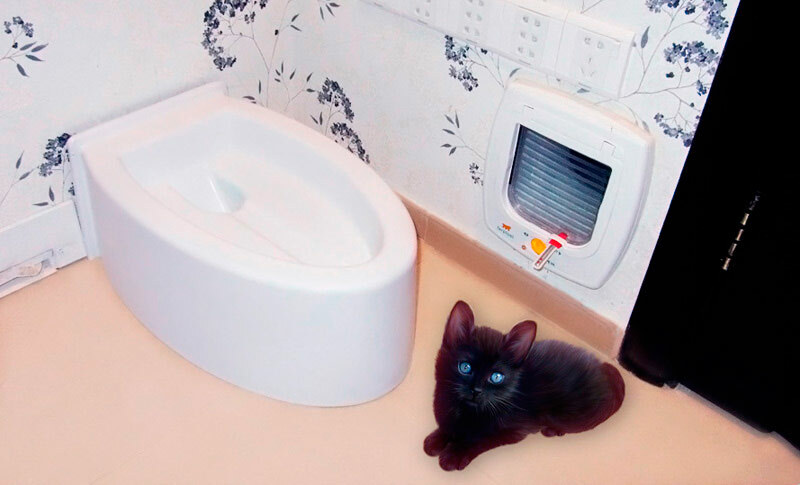 Let's call it an automatic toilet for cats - PetWC, since these are the most common pets for which our miracle device is suitable. But let's not forget that it is suitable for all small animals, which can be trained to use it. Why is PetWC better than traditional devices? But except advantages, PetWC has its disadvantages as well. Does not require a filler. 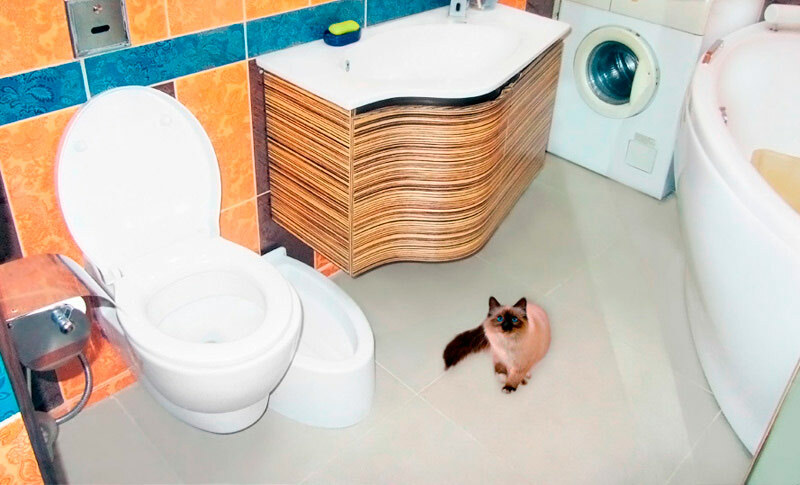 The advertisement of some automatic toilets for cats says that the toilets do not need a filler, but this is far from being the case - periodically, it is necessary to change the litter and add special fluids. PetWC indeed, without any reservations, do require neither fillers nor liquids, nothing at all! It requires exactly the same service as any conventional human toilet bowl. No more than that. Absence of periodic "dirty" work. Very few people are pleased to clean the used filler and wash the litter box. PetWC is deprived of this deficiency. As with a conventional toilet bowl, it must be periodically washed using an ordinary toilet brush - not so difficult. Waste Recycling. It is forbidden to dispose of the majority of fillers into the toilet bowl. They are not household wastes. Where to dispose of them? With PetWC you will have no such issue - all that can be washed away into the sewerage is washed away; nothing else remains in it. Odorless. The advertisement of fillers for cat litter boxes says that they fully eliminate the odors. But this is not the case. Being the owner of a wonderful cat, I have tried a lot of different fillers and I could find none that would really remove the odor completely. The only way that helped me get rid of the odor, was to refresh the filler immediately after each cat's use of toilet. PetWC carries out the flush automatically after each use - there is really no odor, there is nothing to smell - everything is flushed into the sewerage. Freedom! Do you want to go on holiday? What to do with your beloved cat? Familiar situation? There are automatic feeders and waterers - the food problem is solved. But what about toilet? You can trust the advertising and buy very expensive filler, which, according to the manufacturer assurances, is enough for at least two weeks of use. I have tried it. The result was awful. Stench throughout the house and a mountain of sewage into the litter box and around it. There is no such problem with PetWC - go on holiday at any length of time, it will work even if the electricity in your house is shut off. Savings. As we found out earlier, PetWC requires neither fillers nor other periodic investments. Electricity consumption is small enough to be negligible. The only thing you have to pay for - water. Fortunately, it's not a lot of money. Pet's health. When using a litter box with fillers, a favorable atmosphere for reproduction of various pathogenic viruses and bacteria is created because of the fillers. PetWC is deprived of this deficiency - it contains no filler. Reliability. 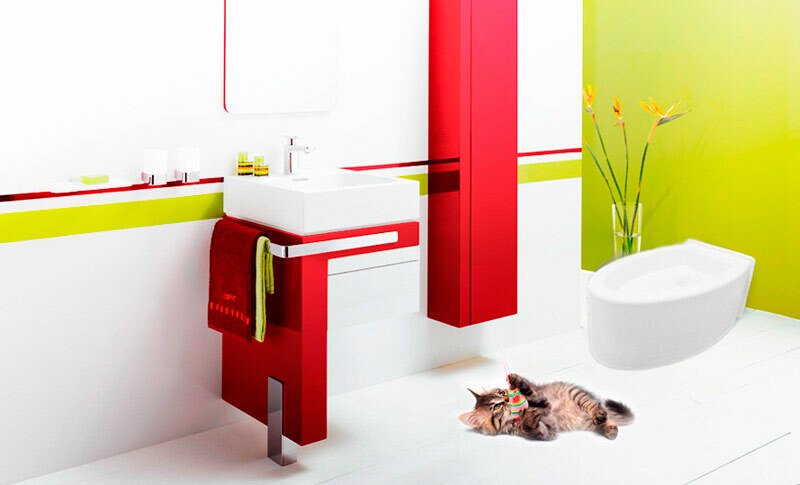 Automatic toilets for cats, which are on sale, have a complex structure and contain a lot of moving parts. We all know that the more complex the design, the greater the probability of its breakage. PetWC is so simple that there is practically nothing to break. What if you have several cats? Conventional litter boxes create sometimes problems - when sharing the litter boxes by different animals, you have to put a separate litter box for each animal. PetWC has no such problem, because it does not preserve the odors. Therefore, the animal cannot select the odor as being its own. The initial cost of PetWC is higher than that of conventional litter boxes. But since it does not require any consumables in use, the cost will pay off very quickly. The need to train your animal to use PetWC.But you should train your animal to use conventional litter boxes as well, isn't it? Installation. Its installation is no more difficult than installing a conventional toilet bowl. A regular plumber can cope with PetWC installation and its configuration. Some work on laying the water pipes and sewerage may be necessary for its installation. This needs to be done once for all, as well as the installation of a conventional human toilet bowl or sink. Of course, the best solution is to do this during the repair process. Will these disadvantages outweigh all its advantages? After receiving your order we will contact you. Copyright © 2013 Kopfgescheit Ltd. All rights reserved. Patent pending.